Finally, after years of releasing albums overseas, America's Stromkern makes its domestic debut. Led by frontman Ned Kirby and the multitalented Kelly Shafer, Stromkern continues to punish the minds and bodies of their followers. With their latest release, Armageddon, the duo has continued to explore a path that has set them apart from all others. From the pulsing beats and elaborate programming of "Re-Align" and "Perfect Sunrise" to the more intricate and melodic sounds of "Armageddon" and "Melt," Stromkern has the abilities to garner a heavy response at both the club and radio levels. 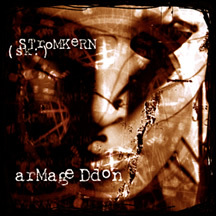 With 4 current releases available overseas and several tracks on various compilations worldwide, Stromkern is now poised to unleash Armageddon on our shores.